A sensational archaeological discovery has been made in the region of Bern, Switzerland, consisting of a communal dolmen grave dating back to over 5,000 years, containing 30 bodies and Neolithic artefacts. It represents the first intact burial chamber to be found north of the Alps. 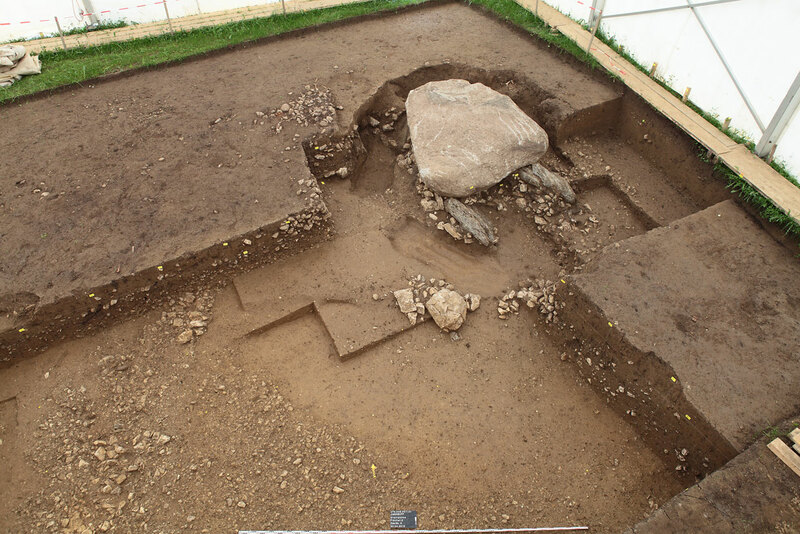 In October 2011, specialists from the Archaeological Service of the Canton of Bern began investigation of the large granite slab weighing in at 7 tonnes. 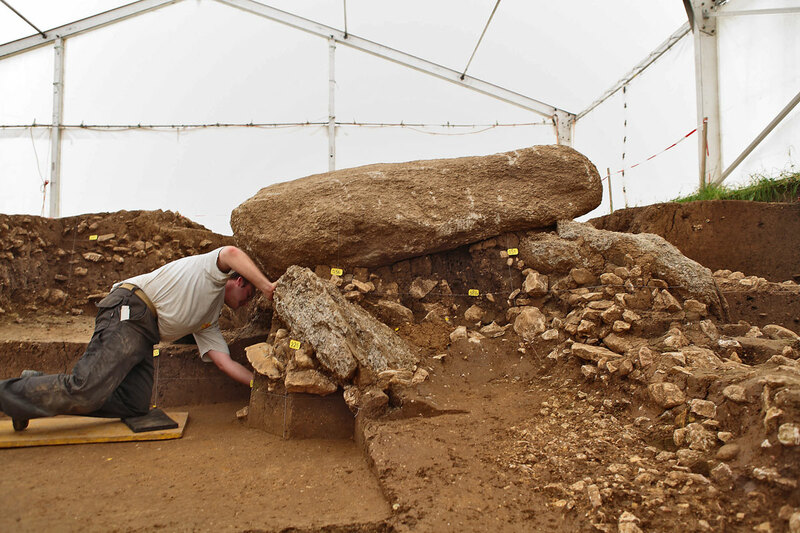 The glacial erratic measured 3 metres long, 2 metres wide and was nearly 1 metre thick – what they did not realise at first was that it still covered a grave belonging to a Neolithic community. The site was originally found when a farmer decided to try and remove the glacial boulder that he had to mow around when cutting grass in his field. The boulder is from the last glacial maximum – some 20,000 years ago – and used by the early farmers during the 4th millennium BCE for burial purposes. According to a report in the Berner Zeitung, Roman and medieval artefacts were found directly overlying the Neolithic layers and show the dolmen was a visible feature in the landscape until at least the 13th century CE. Most of the sediments that cover the site are flood deposits from the nearby river. An intact Neolithic communal burial is slowly coming to light, after fears the grave may have been ransacked in the past. The uprights are slightly tilted due to constant flooding from the nearby river, but despite this, the site is reasonably intact. The excavation of the burial chamber has revealed over 30 individuals as well as what must represent grave goods from the period, including beads, flint arrowheads and even eggshell. DNA testing of the occupants as well as sophisticated analysis of their teeth will be taking place over the next two years. The Swiss Neolithic begins around the middle of the 5th millennium BCE and is coeval with both the Bandkeramik culture in Central Europe and the Vinca culture in the Balkans. 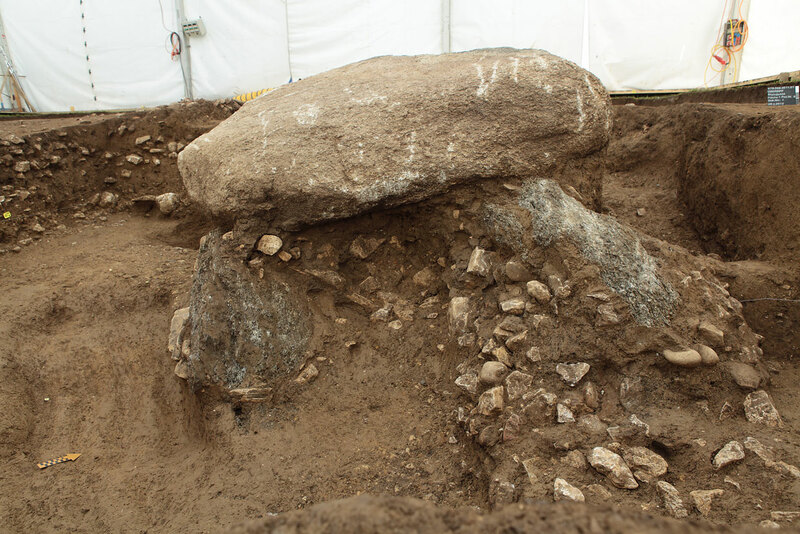 During the 4th millennium – when this dolmen is constructed – the culture seemed to develop independently from the rest of Europe and this excavation may help open up further study into the connections that linked the region during this period. A team from Swiss television’s flagship science programme, Einstein, has been following the archaeologists as they continue their research on the dolmen. A short film (in English) is available below.